If you've got younger children, your Easter probably consists of baskets, treats and dyeing eggs. All things I loved as a child! It's not hard these days to make Easter activities a little more sustainable and eco-friendly, thanks to natural egg-dyeing methods and reusable gifts and decorating options. Funny enough, when I went to take some pictures of the one Easter basket and set of plastic eggs I have at home, I couldn't find them. Could it be that I finally donated that basket!? However, it was a great lesson in using what you have already to make a basket. This galvanized pail would make a great basket alternative that can be used in many different ways year-round at home. For these photo purposes, I just used some of my saved springtimey yellow tissue paper. 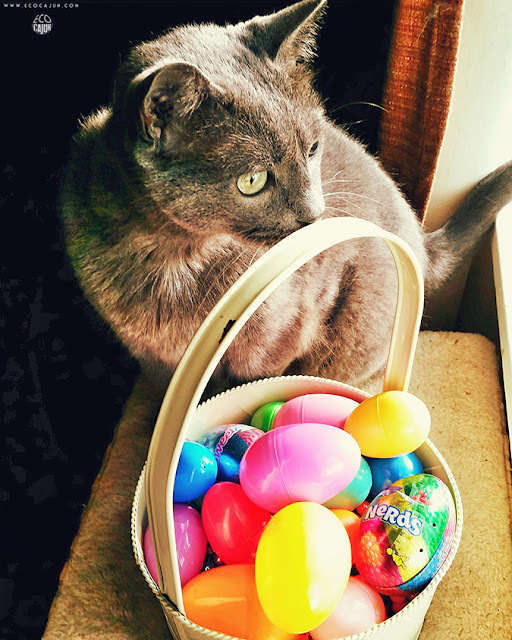 When it comes to Easter baskets, find ones that can be reused each year, instead of buying a new one every time. 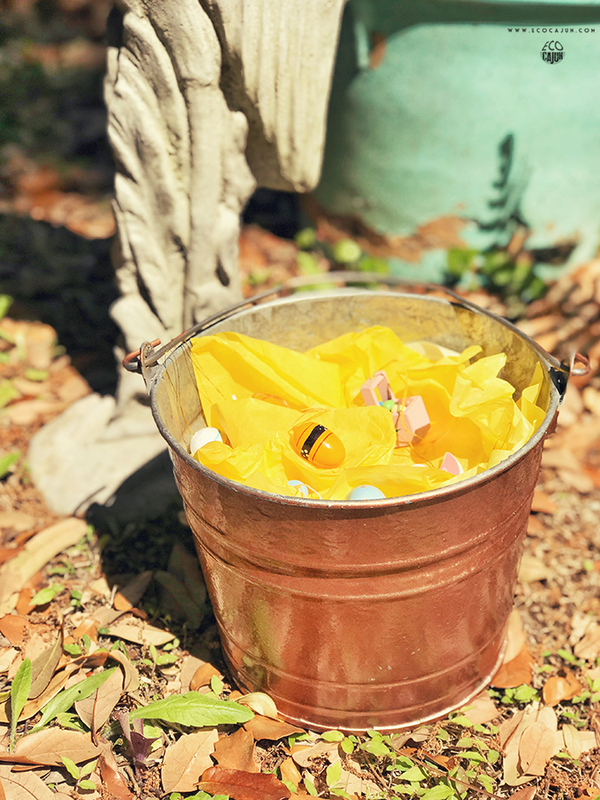 Those prefilled, wrapped-in-plastic Easter baskets look convenient, but they are so much more wasteful than if you just fill your own. That way, you can control the amount of packaging and the contents themselves. 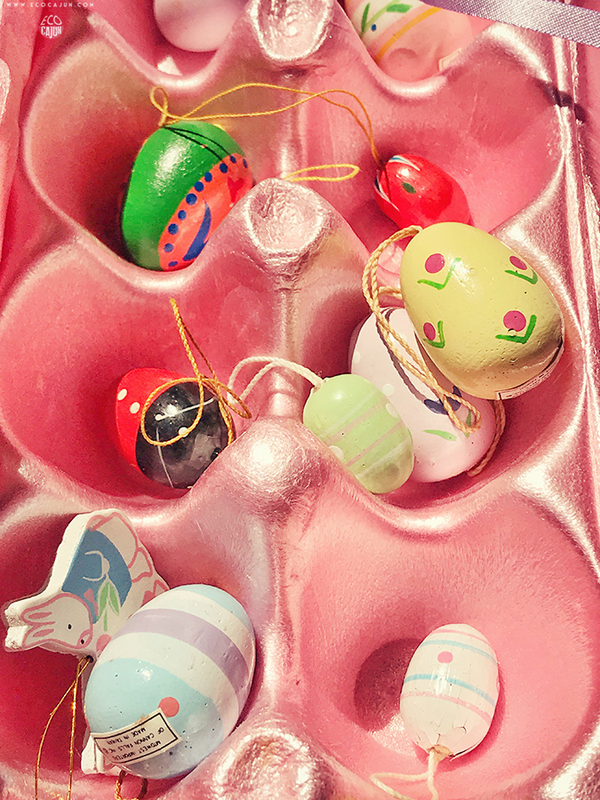 Reuse plastic eggs for as many years as you can. Check to see if there is a number on them before recycling - they may have to go in the trash. Or try to donate if you no longer need them. Skip the plastic grass (you know you want to anyway, because who likes cleaning that up for a month after?) and go for repurposed alternatives. 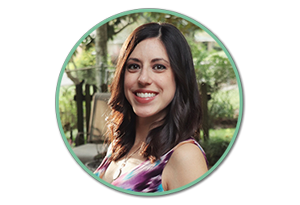 If you have a paper shredder, you can easily make your own basket stuffing, and it's completely recyclable after. Your children won't care if their basket is stuffed with last week's junk mail. Or shred old (not brand-new) tissue paper to give a more colorful effect. 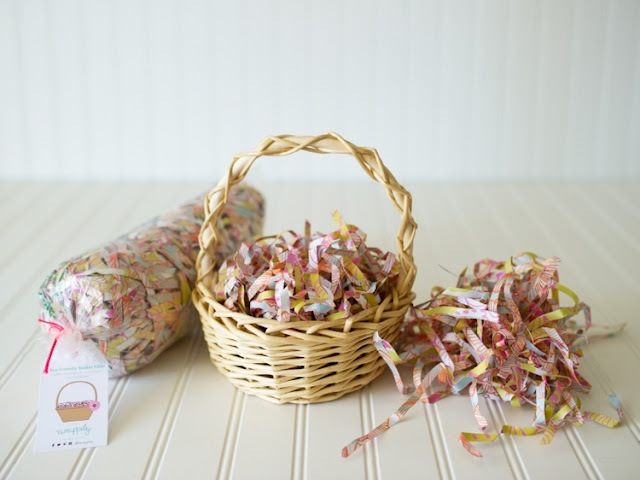 Wrappily, a company that uses newsprint and soy-based inks to print eco-friendly wrapping paper, sells basket stuffing made of their shredded gift wrap. Now that you've got the basket and the filler down, let's get to the good stuff! Choose sustainable treats and gifts from local or sustainable shops. EarthHero has a whole Easter section, and they've got some of the cutest gift ideas, from plush toys to eco-friendly dough to recycled paper pencils. PLUS, you have until Monday, March 19 to order from EarthHero to guarantee delivery before Easter! I'll be honest, I'm 32 years old and my mother still puts together a small Easter basket for my brother and me. It usually consists of chocolate, and sometimes some healthy goods, and I'm certainly not against any of it. If you're putting together a basket for a grown-up in your life, look for fun options like locally made, unwrapped scented soaps or bath bombs, jewelry from local artisans, or even chocolates and treats from a local bakery. 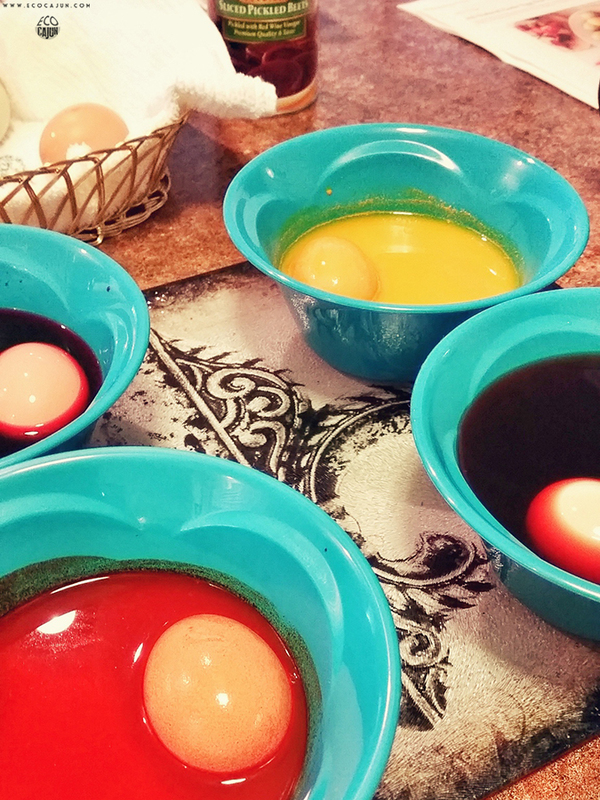 I haven't dyed my own Easter eggs in three years, but I love using food alternatives over vinegar, food coloring or artificial color from a box. Bluish-Gray: Mix 1 cup frozen blueberries with 1 cup water, bring to room temperature, and remove blueberries. Blue: Yes, red cabbage dyed Easter eggs turn out blue! Cut 1/4 head of red cabbage into chunks and add to 4 cups boiling water. Stir in 2 Tbsp. vinegar. Let cool to room temperature and remove cabbage with a slotted spoon. Jade Green: Peel the skin from 6 red onions and simmer in 2 cups water for 15 minutes; strain. Add 3 tsp. white vinegar. Faint Green-Yellow: Peel the skin from 6 yellow apples. Simmer in 1-1/2 cups water for 20 minutes; strain. Add 2 tsp. white vinegar. Simmer 4 oz. chopped fennel tops in 1-1/2 cups of water for 20 minutes; strain. Add 2 tsp. white vinegar. 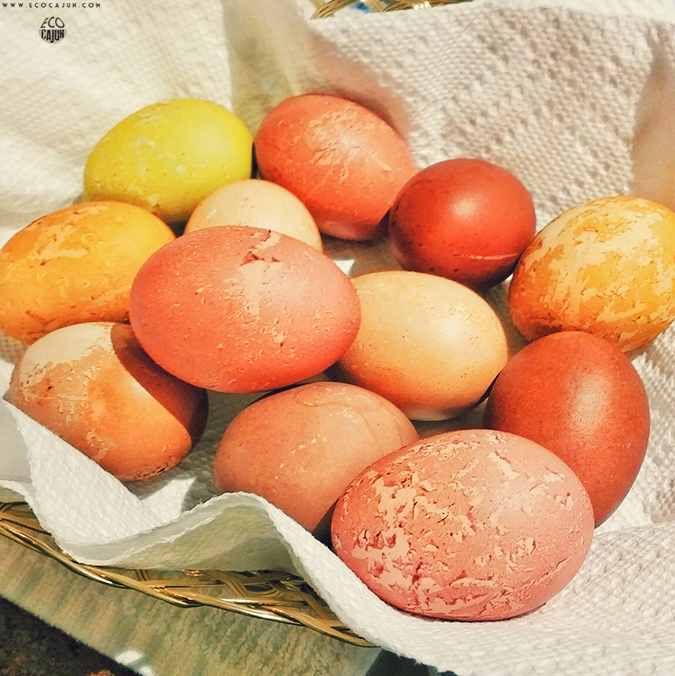 Orange: The longer you soak these onion dyed eggs, the darker the color will be. Take the skin of 6 yellow onions and simmer in 2 cups water for 15 minutes; strain. Add 3 tsp. white vinegar. Faint Red-Orange: Stir 2 Tbsp. paprika into 1 cup boiling water; add 2 tsp. white vinegar. Yellow: Rich yellow: Simmer 4 oz. chopped carrot tops in 1-1/2 cups water for 15 minutes; strain. Add 2 tsp. white vinegar. Brown-Gold: Simmer 2 Tbsp. dill seed in 1 cup water for 15 minutes; strain. Add 2 tsp. white vinegar. Brown: Add 1 tablespoon vinegar to 1 cup strong coffee. Pink: Faint pink: Chop 4 oz. amaranth flowers and simmer in 2 cups water; strain. Add 2 tsp. white vinegar. Simmer the skins from 6 avocados in 1-1/2 cup water for 20 minutes; strain. Add 2 tsp. white vinegar. Mix 1 cup pickled beet juice and 1 tablespoon vinegar. Dark pink: These beet dyed eggs will darken the longer they sit in the liquid. Cut 1 medium beet into chunks and add to 4 cups boiling water. Stir in 2 Tbsp. vinegar and let cool to room temperature; remove beets. Lavender: Mix 1 cup grape juice and 1 tablespoon vinegar. I will state here that using natural food options does take a lot longer than using box dyes. If you have impatient children, this might not be your best option. BUT! There's an answer for that. 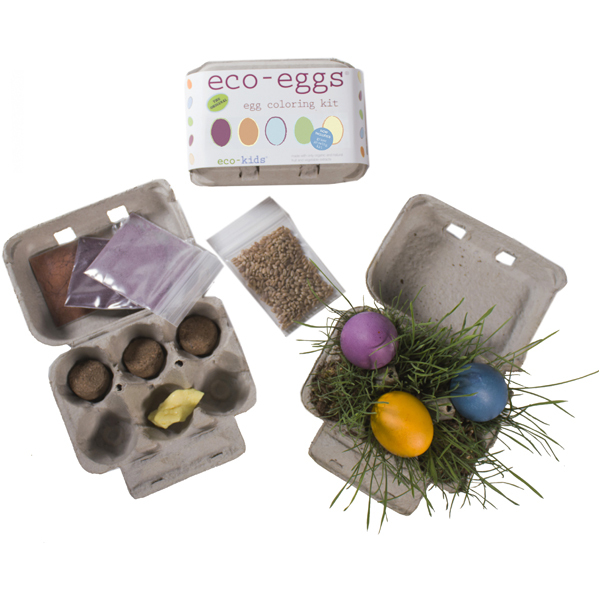 EarthHero carries this natural egg dyeing kit that even has a grass growing kit to display the colorful eggs. The dyes are made from natural and organic fruit, plant and vegetable extracts from annatto seed, curcumin, purple sweet potato, and red cabbage. I'm honestly tempted to try this kit out myself because it looks like a lot of fun! When it comes to drying your eggs, use supplies you already have at home. Repurpose cardboard boxes, or reuse bottle caps as egg stands. Instead of using paper towels, use a cut-up T-shirt or rag, or old towel to wipe up messes and to wrap around your eggs. Shop secondhand for your family's outfits if you have a big gathering or church plans. Decorate with vintage or secondhand items. We have a small collection of wooden Easter ornaments passed down from my mother-in-law that I think are the cutest little decorations. You might even be able to find some secondhand silk spring flowers, instead of buying new ones at the store. Check out EarthHero for natural egg dye kits and eco-friendly Easter gifts for your little ones. Don't forget to use ECOCAJUN to get 15% off your purchase, and order by Monday, March 19 for guaranteed Easter delivery.